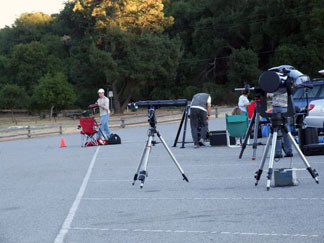 It was another star party at Coyote Lake Park near Gilroy on July 21, 2007. Various telescopes were in different stages of readiness shortly before sunset. The SJAA has brought telescopes to these star parties a few times each summer for the last 4 years. Photo courtesy of Denis Lefebvre. 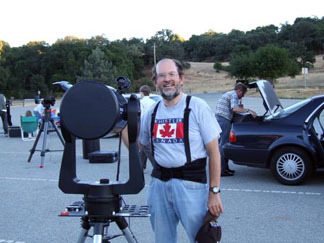 Rob Hawley is shown here with his 10” Meade LX 200. Photo courtesy of Denis Lefebvre.